Alumni Invited To "A Blast From The Past"
Sam Houston State University's alumni are invited to experience a "Blast From The Past" during Homecoming 2000 activities Oct. 26-28. The Office of Alumni Relations encourages guests to "make plans now to join the fun, celebrate with friends, and keep traditions alive." Kicking-off the traditional alumni events on Thursday, Oct. 26, will be the Gold and Silver Reunion Luncheon honoring the Class of 1950 and Class of 1975. Marking their 50th year, the Class of 1950 will be inducted into the Golden Circle Club during the program. Chartered in 1984 as an Alumni Association Chapter, the Golden Circle Club reunites each year during Homecoming. At 11 a.m., members of the Class of 1975 in addition to the Class of 1950 will begin their reunion in the Lowman Student Center. Family and friends are invited to join with University alumni, faculty, and staff for this special occasion. Thursday evening, the Department of Student Activities will sponsor the Homecoming Parade led by SHSU's Distinguished Alumni for 2000. The parade will travel down Bearkat Boulevard to Avenue H, past the University Theatre and Library, ending at the intramural fields for the student spirit rally known as Kat Kall. The Bearkat football team along with the Homecoming king and queen candidates will be on hand for the pep rally. Also, making an appearance will be the Bearkat Marching Band and Orange Pride Dance Team. The awards will be presented at the Sam Houston State University Alumni Association Distinguished Alumni Awards dinner Oct. 27 during 2000 SHSU homecoming activities. The evening will begin at 6:30 p.m. with a reception and silent auction in the foyer of LSC at 6:30 p.m. followed by the awards ceremony and dinner at 7:30. Tickets for Alumni Association members are $25 and $30 for non-members. Tickets must be purchased in advance and can be purchased by calling the Office of Alumni Relations. The Alumni Association Advisory Board will host a brunch in Austin Hall on Saturday morning from 8 to 10 a.m. for all SHSU alumni. At 11:30 a.m., the SHSU Lettermen Association will host its annual Hall of Honor Luncheon in the Lowman Student Center. This year, the Lettermen Association has selected former athletes who competed in baseball, track, basketball and football for induction. Gary Moss, four year letterman in basketball. Tickets may be purchased from the Office of Alumni Relations for $20 each. Laissez les bon temps rouler--Let the Good Times Roll--will be the theme of the Alumni tailgate party at noon at Bowers Stadium, complete with Cajun gumbo and Zydeco music. From noon until 1:45 p.m., Bearkats of all ages are invited to join with the many SHSU organizations gathering for pre-game food and family fun in the parking lot west of Bowers Stadium. At 2 p.m., the gridiron battle between the SHSU Bearkats and McNeese State Cowboys is sure to provide excitement with every play. For tickets to the Bearkat football game, contact the Athletics Department at (936) 294-1726. For additional information regarding Homecoming activities, contact the SHSU Office of Alumni Relations at (936) 294-1841 or Office of Student Activities at (936) 294-3861. 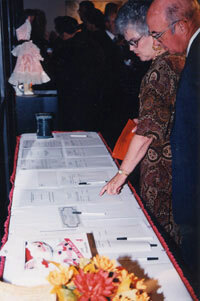 Events and activities are also listed on the web at Homecoming 2000.